All payments must be made in PHP (PESO) at the SMX Convention Center Lobby. Please bring a PDF, image, screen capture or printed copy of your pass. 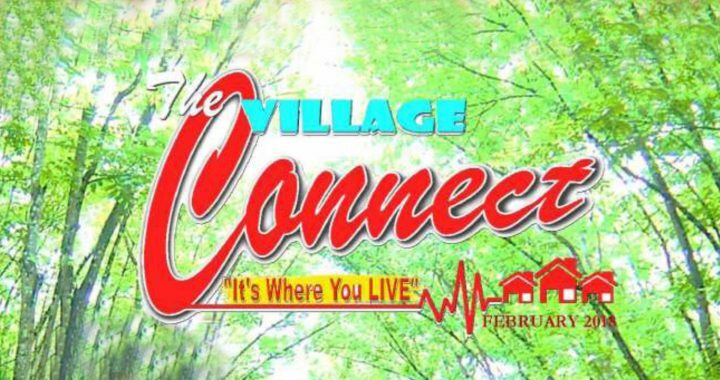 The organizer will not be held liable for visitor’s dealings/transactions with the exhibitors. The organizer will not be held liable for accidents, theft and/or any untoward incidents in the exhibit areas. Security check shall be strictly conducted by appropriate Expo personnel. Explosives and deadly weapons are strictly prohibited inside the exhibition areas. Wear proper attire – Business Casual. Wearing of sleeveless, undershirt and slippers are strictly prohibited inside the expo hall. Wear the visitors badge inside the exhibition hall at all times. 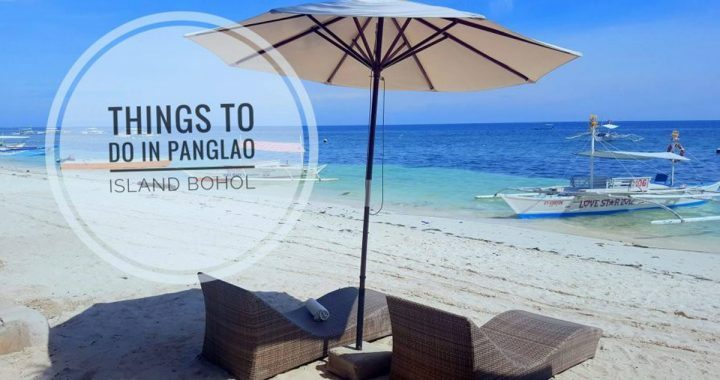 Situated at the southeast part of Panay Island in the Visayas, ILOILO is yet another top destination in the Philippines. As its locals claim, it is simply the very representation of what the archipelago can offer, a synergy of steps wrapped of natural wonders in culture and topography in the bigness of a dance that is the Philippines. 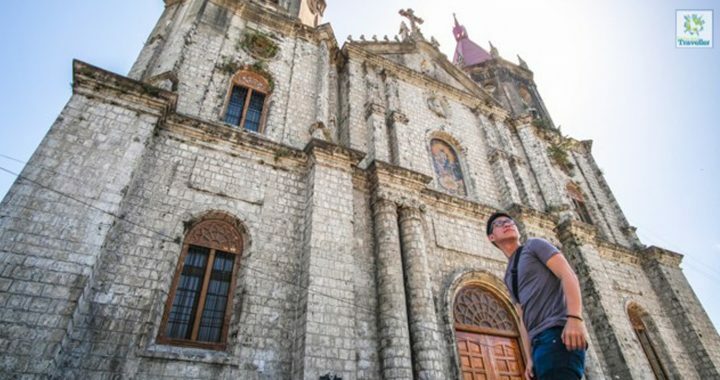 While here, spend an extravagant amount of time wandering through its age-defining mansions and churches that are dated as far back as the Spanish era. Taste a plethora of delectable cuisine that is uniquely Filipino, from pancit Molo, chicken inasal to La Paz batchoy. Soak up in the presence of a stronghold of Catholicism as you take part in Dinagyang festival, a religious dance in honor of the young image of Jesus Christ. And, wonder at the staggering work of nature that stretches from the outskirts of the city to the edges of Islas de Gigantes. Visit Iloilo and discover what makes the province the indefinite beating heart of the Philippines. Baguio City, Philippines — Are you planning to experience the 2019 Baguio City Panagbenga Festival? 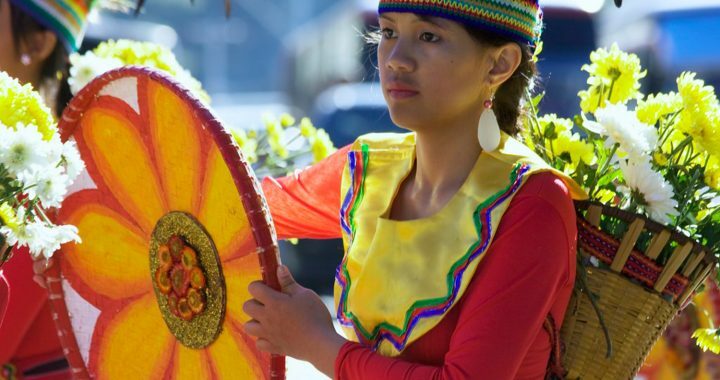 The official Panagbenga Festival 2019 Calendar of Activities was already released by the Baguio Flower Festival Foundation for those who are planning to witness the festivities. Now on its 24th year, this years theme is “Blooming Forward”. The Flower Festival will start on February 1 and end on March 10, 2019. “Panagbenga”, a Kankanaey word meaning “blooming”, was first staged in 1996 as a recovery measure after the 1990 earthquake in North Luzon, since then, it continued to attract local and foreign tourists every year to experience the colorful festival. Panagbenga Festival is considered as one of the most attended festivals in the Philippines and one with the largest media coverage. The highlights of the yearly flower festival are the Street Dance Parade, and Grand Float Parade that showcases multicolored floats covered entirely from flowers of every kind. In this Panagbenga 2019 Blog, we listed some tips on how you can do your own DIY trip to Baguio City. We also included Baguio City Guide + Itinerary, Things to do and see, where to stay and more. 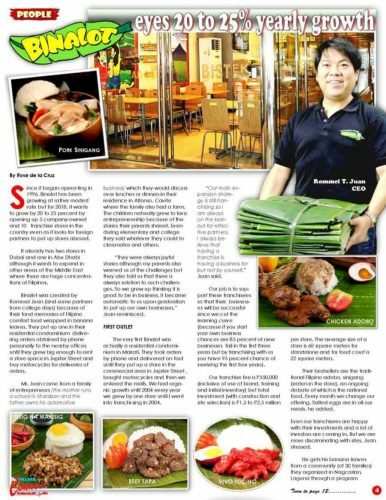 If you love eating Filipino dishes such as inihaw na baboy, daing na bangus, and adobo enhanced with the experience of consuming it wrapped in banana leaves, you probably would love to eat at BINALOT! Interested to franchise this food business? 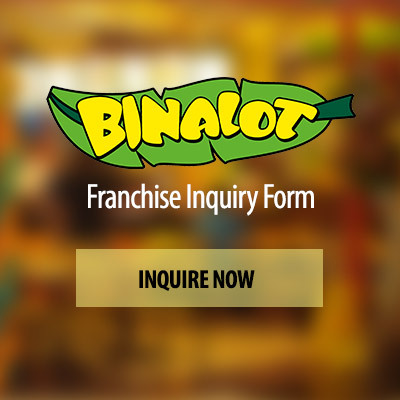 Check out the franchise fee and other franchise details of BINALOT below. 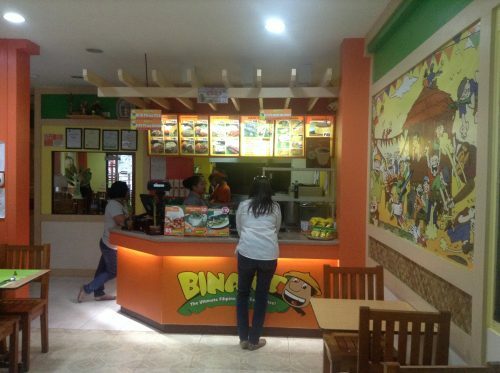 BINALOT, owned and operated by Binalot Fiesta Foods Incorporated, is a chain of quick service restaurants that offers Filipino meals wrapped and served in banana leaves. This is also the reason why it’s called BINALOT, since the term literally means “wrapped” in Filipino. BINALOT’s menu is composed of Filipino meals such as tapa, adobo, bistek, longganisa among others, all meals atop hot rice and garnished with salted egg and tomato. 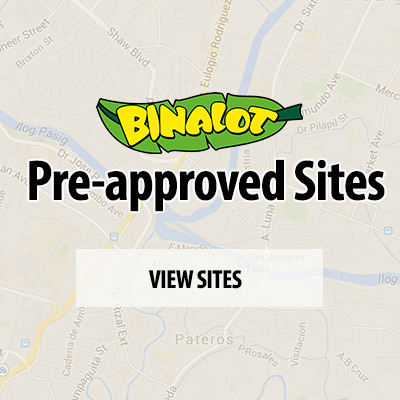 The BINALOT franchise fee is P600,000 for locations in Mega Manila and P700,000 for provincial locations. Estimated total investment, including the franchise fee, is P3.5 Million to P3.9 Million. It already includes the kitchen equipment, cookware, utensils, construction signage, POS renovation, menu board, and murals. Estimated total investment, including the franchise fee, is P2.8 Million to P3.5 Million. It includes kitchen equipment, cookware, utensils, construction signage, POS renovation, menu board, and murals. Estimated total investment, including the franchise fee, is P 2.5 Million to P2.8 Million. It includes kitchen equipment, cookware, utensils, construction signage, POS renovation, menu board, and murals. 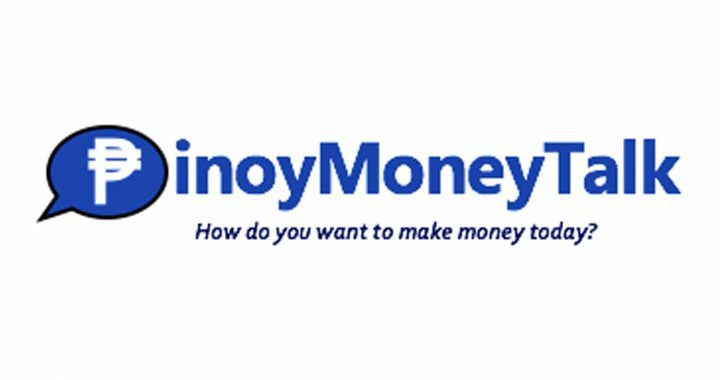 Estimated total investment, including the franchise fee, is P1 Million to P1.2 Million. It includes equipment, marketing collaterals, staff training, and recruitment support. 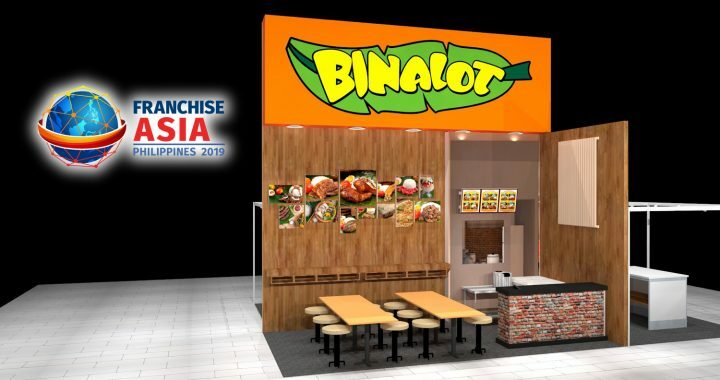 The BINALOT Franchise Agreement is for 6 years from the date of contract signing. However, the franchisee may renew the contract upon mutual agreement with the franchisor. There is a renewal fee of 50% of the then-current franchise fee. In addition to the initial franchise investment, the franchisee shall remit every month a royalty fee of 5% of gross earnings and a Marketing Support Fund of 2% of gross earnings. 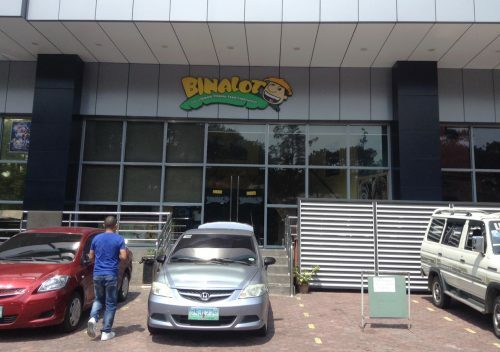 The franchisee can use the BINALOT business trade name, and accompanying logos and signage for business purposes. 2. The franchisee can use the Business Operations System which is used to facilitate BINALOT branches to operate smoothly and profitably. There will also be free initial training of the the franchisee and initial staff. However, additional staff for training shall be for the franchisee’s account. 3. The company shall assist the franchisee in the training and recruitment of the pioneer store team. A maximum of 5 employees shall attend the full training which would provide the operational, technical, and administrative aspects of the business. The franchise fee includes the training cost. 4. Unless otherwise specified, the franchisee must purchase all supplies, products, and packaging materials only from the company’s accredited vendors. 5. Marketing paraphernalia shall be provided by the franchisor, especially on promo launches, store opening, and other marketing activities. 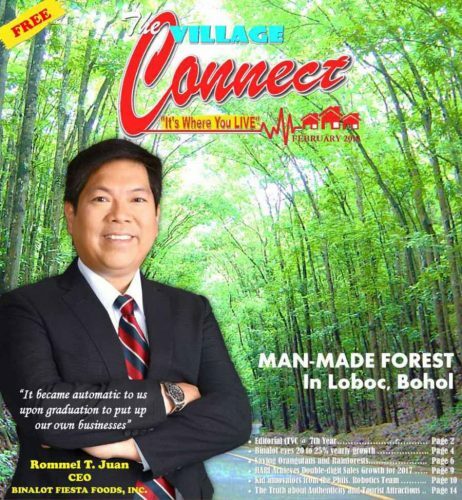 Marketing expenses on a national scale are charged against the National Marketing Support Fund (NMSF) while those for local marketing initiatives are for the franchisee’s account. 6. There are accredited contractors who would build the franchisee’s store. The design of the store is standardized for a greater brand impact. 7. In order to ensure and maintain quality control, to address daily operational concerns, and to determine the store’s specific needs, BINALOT has a dependable and competent team who conduct regular field visits in order to give on-site assistance. It is also the company’s policy to do Research and Development in order to continuously provide and develop innovative Pinoy dishes and new standards for delivery service. Afterwards, the aspiring franchisee will be asked by the Business Development Officer to attend a franchise orientation. The applicant shall submit an accomplished Franchise Qualification Form provided by the Business Development Officer. 2. The aspiring franchisee shall undergo a preliminary interview. If favorable, he or she then takes a franchise suitability test. Afterwards, there will be an inspection of the proposed location. The applicant may also be presented with a list of locations. If the location passes the evaluation, the aspiring franchisee shall pay a non-refundable reservation fee of P20,000 for Metro Manila and P40,000 for provincial areas, which covers a 30-day period. However, the reservation fee is transferable to another site and deductible from the franchise fee. Further, the aspiring applicant shall conduct a market study. 3. Site approval shall be secured. Investment estimates and financial projections shall be presented by the Business Development Officer to the aspiring franchisee. 4. Finally, the aspiring franchisee shall sign a Memorandum of Agreement and Franchise Agreement. 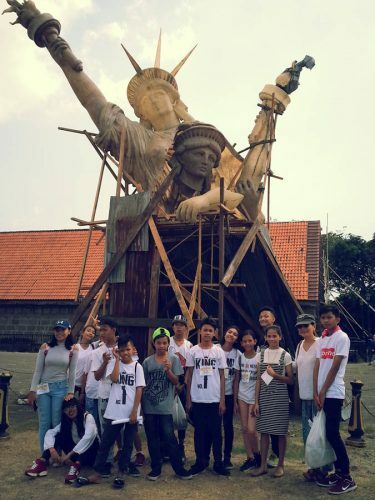 It was a beautiful day in Intramuros when the ACAP Kids visited the Manila Biennale: OPENCITY 2018. Fifteen kids from the Action for the Care and Development of the Poor in the Philippines (ACAP), a non-profit organization dedicated to empowering marginalized youth in the Philippines, went to the four exhibition sites of the Manila Biennale and enjoyed all the art installation works of the biennale artists. It was their first time in Intramuros and each venue was new and interesting destination for them. Didit Vander Linden, ACAP President and Program Director, went on the walking tour with the kids along with ACAP Program Manager Jeff Ruaza. The tour was led by Manila Biennale Social Media & Student Tours Manager Eve Javier – that’s me. My story is about how these kids gave so much meaning to the biennale exhibits for me personally, and I want to share this with you. We all met at Plaza San Luis where the introductions were made and some shy faces greeted me hello. 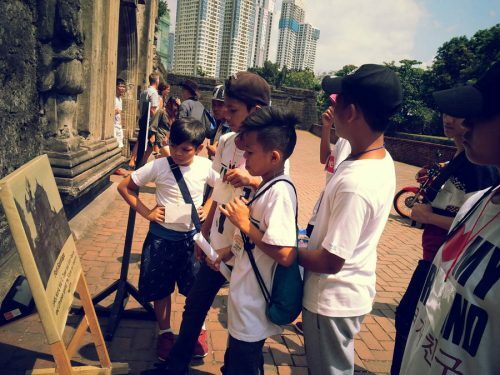 Then we began walking off to Baluarte de San Diego where they enjoyed looking at the work of Zeus Bascon, posed for some photo ops and afterwards the kids ran freely and happily at the grassy fort, shyness now gone, and they took time to listen to the history of the baluarte. It was a very serious and intense moment when they read the message of Kiri’s work, saying it out loud in Tagalog, and telling me, Didit and Jeff about how they understood what the artist was trying to say. To be right there witnessing these young individuals who have complex backgrounds (and continue to live in desperate conditions still), grasp the sophisticated message of the artwork of the biennale and appreciate the whole point of the exhibition – became a very emotional moment for all of us, but we adults kept our cool, shed no tears (or maybe, hid the tears) and moved on. I would often mention them to that the theme of the Manila Biennale for this year centers on war and remembrance, and the kids did not hesitate to tell me in their own words how they Understood. Lunch was sponsored by Binalot, served under the shade and the kids happily took a break from all the summer sun walking. Afterwards, everyone was called to join Museo Pambata and Sipat Lawin beside the Bayanihan Hopping Spirit House of Alwin Reamilo, for an afternoon of reading under the trees in the Bamboo Garden, and later, Sipat Lawin did a fantastic workshop where the kids were taught performance art, and the song and cheer for the parade of the Bayanihan. “Bawat Bata” was rehearsed with so much joy and passion, that some folks surrounding the children had forgotten their coolness and shed happy inspired tears. After the rehearsal, they had a snack of pancit along with some volunteers of the Bayanihan: Philippine army men, pedicab drivers, foreign visitors of Intramuros, artists and friends. 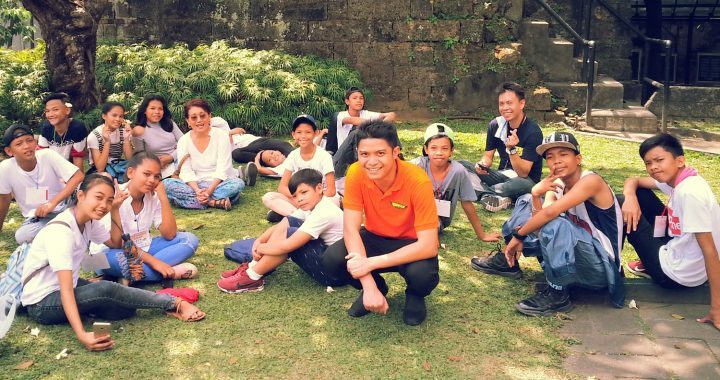 It felt like one big family picnic under the trees in an enormous park, and the kids laughed, ate pancit, lamented on the green mangoes that fell on Fort Santiago’s moat, relaxed for a bit, and talked happily with media that wanted to interview them. It was love all around. The highlight of the day came and the ACAP kids were positioned at the helm of the Bayanihan parade, to sing Bawat Bata and give their powerful chant ” Ang bawat bata sa ating mundo, Ay may pangalan may karapatan”. They led the Bayanihan with such pride and joy, it was a moment that brought Intramuros so much life…from kids who have so little in life. Leading the massive pack of people carrying a house on their shoulders, they marched to Plaza Roma to welcome the house at its new neighborhood, with incense and prayers and good thoughts. It was such a great feeling for us to have the ACAP kids be the leaders of such a meaningful Filipino event, to have them excitedly cheer for the adults bringing such a weight of a house on their shoulders, and to lead the all people at such a festivity. For me to be given the opportunity to walk alongside these kids for the day, and have them share their thoughts about life, struggle, perseverance, and Hope, was a great honor. Thank you Carlos Celdran for hosting the ACAP Kids at our Manila Biennale, you gave them a chance to be leaders at this groundbreaking event of ours. Thank you Binalot for nourishing them and adding the extra rice. Thank you Museo Pambata and Sipat Lawin, you lifted their spirits and souls. This truly was the essence of our theme, to bring back the soul of the city. And it’s in these kids. 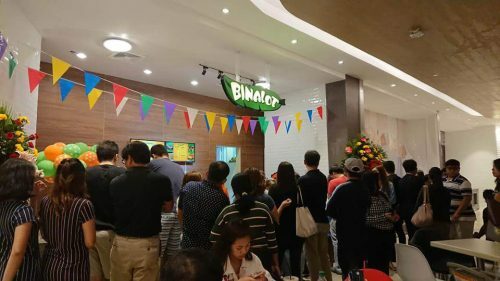 Homegrown Filipino fastfood Binalot has recently opened 2 more outlets in the United Arab Emirates. 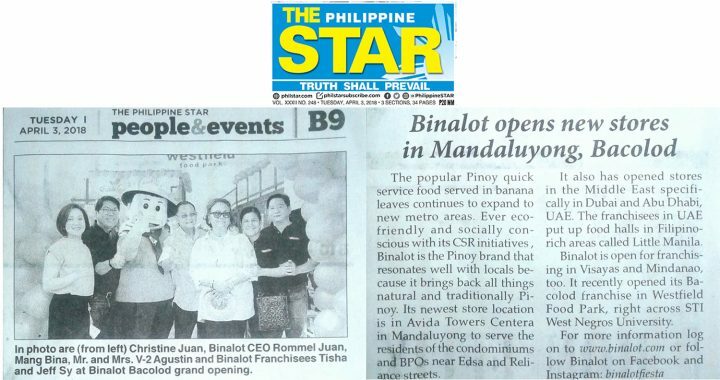 The 2nd UAE branch of Binalot opened in Deira City Centre, the busiest mall in Dubai where most Filipinos frequent. The latest one is the Little Manila Abu Dhabi branch at Al Roumi Building, Fatima Bint Mubarak Street, Al Dhafrah (across Burjeel Hospital). Binalot President Rommel Juan visited Abu Dhabi for the grand opening which was graced by Ambassador Constancio Vingno, Jr.
“We are very happy with the opening of Binalot Abu Dhabi because it is sure to be the destination of choice for Filipinos in Abu Dhabi,” said Juan in a media release sent to GoodNewsPilipinas. 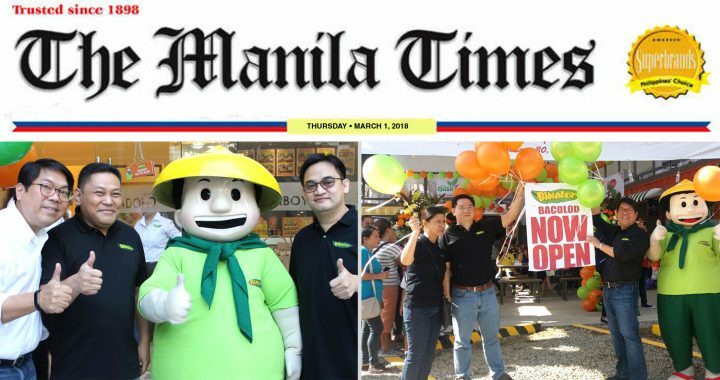 Binalot Fiesta Foods initially entered the Middle East market by granting a franchise to the Al Ahli Group, a large Dubai-based conglomerate. 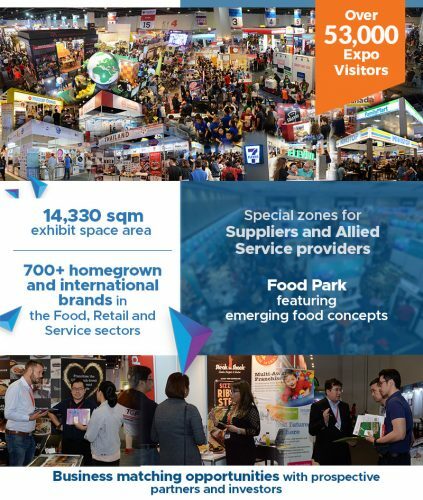 The partnership flourished into creating the largest All Filipino Food Court in Dubai called Little Manila. Little Manila boasted of 1000 square meter dining space with 10 Filipino brands to choose from. Little Manila quickly became the “in” place to dine among the Filipino communities in Dubai where big crowds can commune, feel at home and enjoy Filipino food. It became the cure for homesickness for the Filipinos in Dubai. Binalot is the flagship brand of Little Manila, serving its famous All Time Pinoyvorites like Adobo, Tapa, Sinigang and Bistek. It now even offers boodle fights for groups of 10 to 20 people.